6.5(B): TSW solve real-world problems to find the whole given a part and the percent, to find the part given the whole and the percent, and to find the percent given the part and the whole, including the use of concrete and pictorial models. 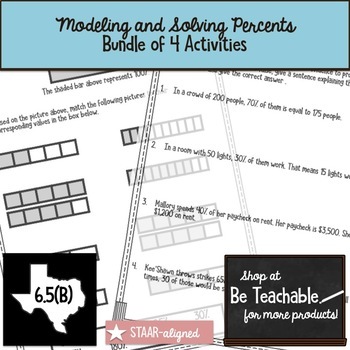 This resource is a bundle of 4 separate activities. The activities can be utilized as math stations, homework assignments, extension activities, effective filler during transitions, etc. "Picturing Percents"- Matching models to percents based on a given model of 100%. A STAAR inspired resource. "Who Drew It Best"- Students compare the work of two imaginary students and justify which students answered correctly. Excellent resource for spotting and correcting misconceptions in class. 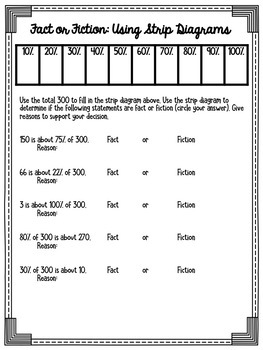 "Fact or Fiction: Using Strip Diagrams"- Given a total, students utilize a concrete manipulative (strip diagram) to justify if five statements are fact or fiction. 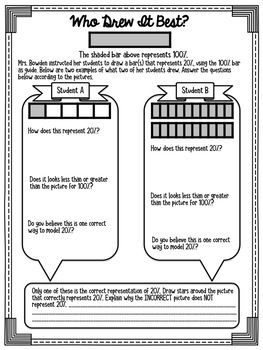 "Prove It: Using Strip Diagrams"- Students have to sift through part, percent and whole to justify if 4 statements are true or false. 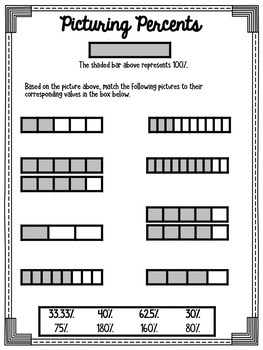 Strip Diagrams are encouraged, but students are expected to draw them.